Believe it or not, this is the first time I’ve ever made brownies that weren’t from a box, and boy was it enlightening! My husband and I have been together in some way (dating or married) for going on 8 years now. You’d think that would be enough time to get to know a person, right? I had just finished baking this batch of Peanut Butter & Nutella Brownies. I had cut them and set them out on the counter to cool when my husband came bounding up the basement stairs into the kitchen. He spotted the brownies and said, “Those look good! Can I have one?” I was a little surprised at his enthusiasm because I generally have to beg him to try my baked goods (he doesn’t have much of a sweet tooth), but I said “Sure, go ahead.” And that’s when he said it. “Brownies are my favorite!“, he exclaimed. No way! 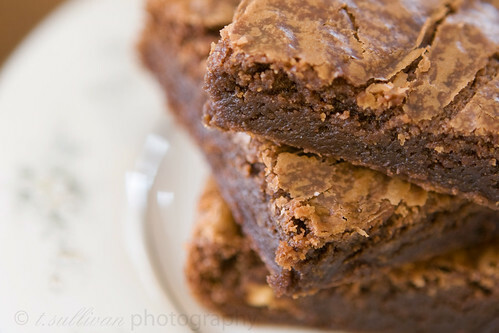 Brownies are MY favorite. How has this not come up before in the 8 years we’ve been together?! Anyway, back to the brownies. I have absolutely no patience when it comes to brownies, so I have to exercise every ounce of self control I have not to eat them when they’re straight out of the oven, still molten lava hot. (Sometimes I succeed.) I had already licked the batter from the spoon (what, like you don’t do that?) and tried some of the smaller pieces that broke off as I was cutting them. When I finally tried a whole brownie I thought they were a little too sweet for my liking, but my husband declared them perfect. And brownies are his favorite, so he would know! After trying another brownie the following day, I decided they really are a bit sweet for my taste. I like my brownies very dark and fudgy with a deep chocolate taste. These definitely deliver on the fudgy part, but dark and deep chocolate they are not. I’m also sorry to say that the Nutella flavor doesn’t really come through in the finished brownies. However, don’t let that stop you from making them! The peanut butter in these brownies pairs so nicely with their sweet milk chocolatey flavor that we couldn’t stop eating them. The whole pan was devoured in less than a week. This is a very adaptable and forgiving recipe. When I made mine, I forgot to put in the vanilla! I also didn’t have an 8×8 inch pan, so I used my standard 7×11 inch pan which worked just fine. You can also double this recipe and bake it in a 9×13 inch pan. To make these more chocolatey next time, I might increase the cocoa powder to about 1/2 cup. Preheat oven to 350°F. Line 8×8 inch or 7×11 inch pan with baking parchment paper. Measure the flour, cocoa powder, baking powder and salt into a small bowl and whisk to combine. Stir the sugar into the melted butter. Beat in the eggs one at a time, then stir in the vanilla. Add the dry ingredients and mix until combined. Pour batter into pan and bake for 20-25 minutes, until top forms a crust. I am going to try these!!!! 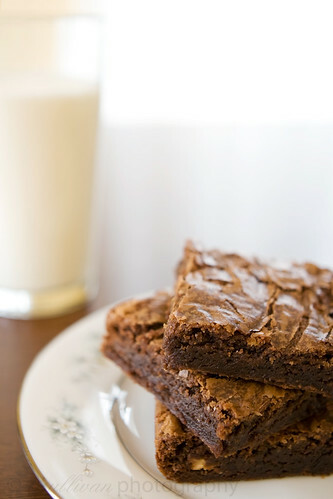 all you need is LOVE & brownies ! but I never thought about adding up and mix nutella & peanut butter so I definitely want to try these. LOL – Sorry about the inches, it’s an American thing! Half the time I don’t even remember what size my pans are, so I have to get out a ruler and measure them! oh man. i can’t wait to try these. yumm.